RESPECTFUL HOMAGE TO THE NOBLE TRIPLE GEM. Then and there, ten thousand world-systems thoroughly shook as well; they shook thoroughly and intensely. They quaked thoroughly and intensely. They became heedful, became wondrous, and became illuminated. Thus did it occur throughout the worlds; thus did the worlds become. Brahmā had heard the teaching of the Dharma; and the gods each went to their own abode. “Kauṇḍinya has thus understood everything. Kauṇḍinya is one who understands it all. THE SŪTRA ON THE MIGHTY TURNING OF THE DHARMA WHEEL IS COMPLETE. Special thanks to Géshey Lobsang Chögyel Rinpoché (dge bshes blo bzang chos rgyal rin po che) for his profound and powerful teachings and commentary on this discourse on the holy day of Chökhor Düchen, the ‘Great Celebration of the Dharma Wheel’, using the other ‘Missing Translator’s Colophon’ version (‘gyur byang med pa), for which I had the good fortune to interpret for a group of about ten people in Rinpoché’s room. 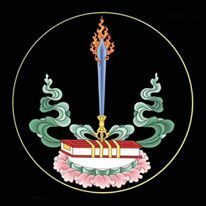 Also special thanks to my long time teacher and translation adviser Gen Lobsang Gyatso (rgan blo bzang rgya mtsho) for his insightful and erudite commentary on the Tibetan text, and to Gésheyma Zangmo (dge bzhes ma bzang mo) for her kind and lucid explanation of Illuminating Emancipation’s Path: An Exposition on the Four Noble Truths & Dependent Arising (bden bzhi dang rten ‘brel gyi rnam par bzhag pa thar lam gsal byed ces bya ba bzhugs so) by Choné Jetsün Drakpa Shaydrup (co ne rje brtsun grags pa bshad sgrub). Pingback: Letter to a young practitioner.